Ok so as not to lose people before I even get started, I'll translate that for you. It's "Hello" in Hungarian, and you say it like this: yo nah p-oh-t. Easy right? Not really, Hungarian is notoriously tough to learn and it's taken ages just to get hello to stick in my head, but that's another story. So now that you're here, you must be wondering what could be the reason for the return of the groan-inducing headlines? 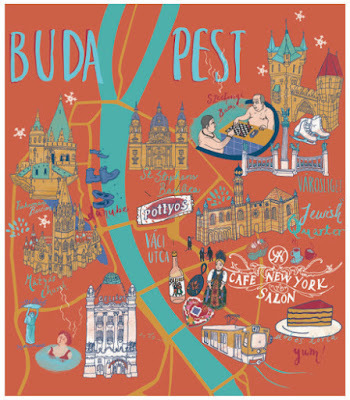 I'll share a bit of news with you: I have moved to Budapest, Hungary! That's right dear readers, a hungry man is back on the road - well, at least for the next ten months or so. Now do you see the connection? Hungry for Hungary?? Get it? Ok, lets move on. Truth be told, it's definitely an odd move for the hungry man and his blog, especially since the blog has not exactly been an active place to visit for the past few years. But, with my partner working on a new TV series in that country, it was either stay in Toronto alone, or pack up and try a new life - AND a new opportunity to write about it. Not just sad attempts at learning the language, but hopefully new culinary experiences and potential life-changing adventures to share. What - did you really think I'd say no to that? Have you read this blog? I'll be honest in saying that I had some trouble processing the move. As with anything in life, there are stories behind the scenes that usually lead to decisions that become "life-changing". It wasn't exactly a surprise that an opportunity to work abroad would eventually happen to my partner, but in light of some recent local changes in our lives, it was definitely unexpected timing-wise. My partner and I just bought a new place and almost immediately after we moved into the apartment, we're packing up and leaving to go to a new country. So I've been asking myself a LOT lately how this will turn out, and in return I'm basically receiving silence as an answer. But here's the thing, I really believe that every now and then a good life shake-up is needed. I'm not talking about doing what I'm doing, basically saying piss off to your old life and just packing up and leaving what you've built with your life. It's been said so many many times before that life is short, and unless there are serious or, maybe comfortable reasons for staying put, why not give something new a chance? What is stopping you (i.e. me?)? It's a four letter word. F-E-A-R.
Ah yes, fear is a huge reason why people don't embark on life changing adventures and God knows I am not immune to that feeling. It took a great deal of therapy to realise just how much fear can dominate your life, especially when you get older. That sense of wanderlust when you're younger can get buried as you get older, and is often replaced with "oh my God what if I don't have this or that with me?" What if I can't find this or that?" I have everything I need right here in .... and now, we just get up and leave it?" What will happen to me? To us?" As your head slowly expands with all of those questions, growing steadily until it's ready to explode! But you do it - because it's also something you absolutely do not want to miss out on. It's time to overcome fear and get moving... question is, what do I do when I get there?